Print the ribbon pattern and hold it securely with your fingers on top of a piece of blue craft foam. Cut around the pattern, through the foam, to create your blue ribbon. Use black marker to write which competition your cabin won, then glue it to the visor. 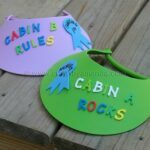 Use alphabet letters to write out your cabin and a fun celebratory phrase such as “Cabin A Rocks” or “Cabin B Rules”. This project for Camp Crafts: Winning Visors was printed from CraftsbyAmanda.com - https://craftsbyamanda.com/camp-crafts-winning-visors/ and can only be printed for education or personal use.